Falkivsky, Dmytro [Фальківський, Дмитро; Fal'kivs'kyj; pen name of Dmytro Levchuk], b 3 November 1898 in the village of Lypesy, Kobryn county, Polisia, d 16 December 1934 in Kyiv. Poet. Falkivsky served in the Cheka in Belarus in 1920–3 and thereafter lived in Kyiv. He was a member of the literary organizations Hart, Lanka, and MARS. From 1924 his poetry was published in the leading Ukrainian literary journals. Falkivsky is the author of the poem Chaban (The Shepherd, 1925) and the collections Obriï (Horizons, 1927), Na pozharyshchi (At the Burning Place, 1928), and Polissia (1931). 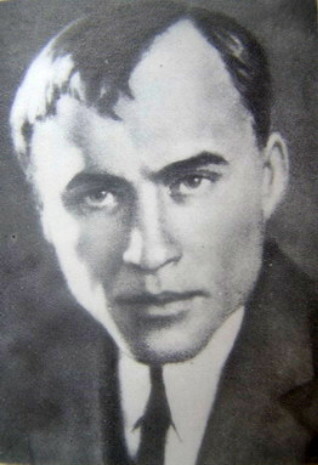 In 1927–33 he worked as the secretary of the journal Kino of the All-Ukrainian Photo-Cinema Administration. Falkivsky was a lyrical neoromantic. His poetry often displayed autobiographical elements (the Cheka, the Revolution of 1917 and civil war, life in Polisia). He was criticized for his extolment of village life and his critical pessimism. Falkivsky’s later poetry was influenced by the Neoclassicists. He was executed by a military court together with 27 other cultural figures, including Hryhorii Kosynka, Oleksa Vlyzko, and Kost Burevii, for alleged terrorism. An edition of Falkivsky’s works, Raneni dni (Wounded Days), was published in Prešov in 1969.